This afternoon’s assessment shows that the flow front remains active however has not advanced since Thursday. All activity along the front has been limited to breakouts along the margins or sides of the flow as well as on the flow surface. The front remains approximately 480 feet from the Pahoa Village Road. Additional breakouts upslope of the flow front are being monitored and those breakouts currently do not present with an immediate threat to area residents. 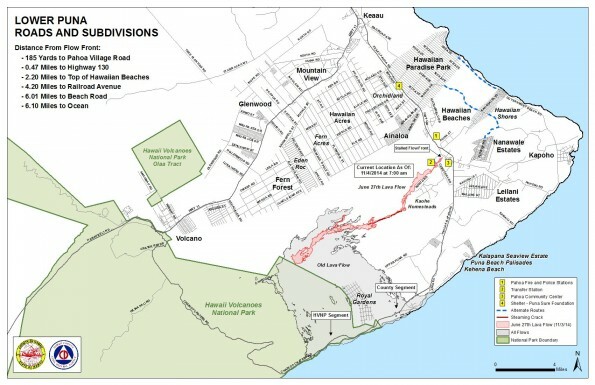 The upslope breakouts are located approximately .7 to 1.5 mile above the Apa‘a Street area and along the North side of the flow and moving in a North Northeast direction. 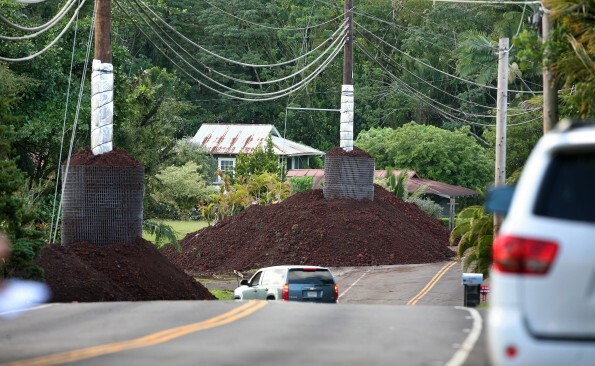 The Pahoa Village Road between Apa‘a Street and the Post Office Road will remain closed and limited to area residents only. 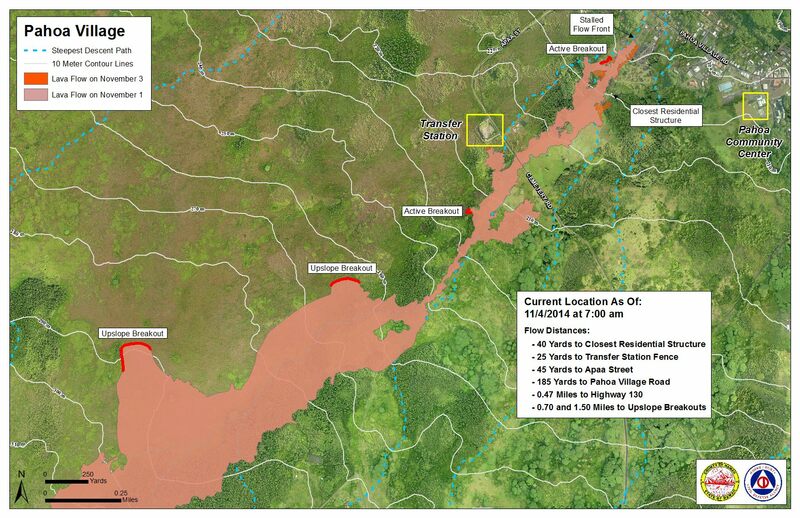 In addition, Civil Defense and public safety personnel will be operating in the area round the clock to maintain close observations of flow activity. 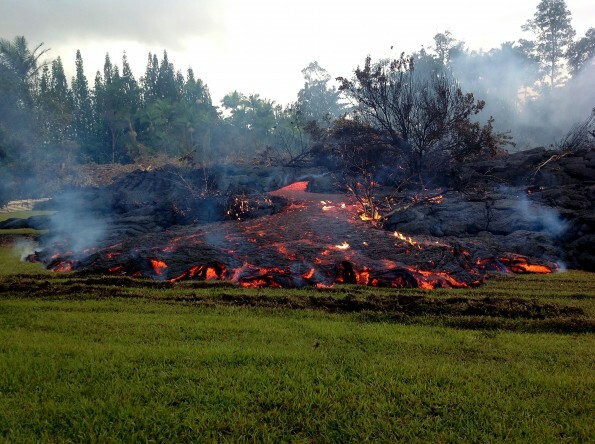 The next lava flow community update meeting will be held with representatives from Hawai‘i County Civil Defense and the Hawaiian Volcano Observatory on Thursday, November 6 at 6:30 p.m. at the Pāhoa High School Cafeteria. Scientists of the USGS Hawaiian Volcano Observatory conducted ground observations of the June 27th lava flow throughout the day on Tuesday, November 4, 2014. The leading edge of the flow has not advanced since last Thursday, October 30, but the flow continued to inflate, and minor breakouts were scattered across the flow interior behind the flow front. 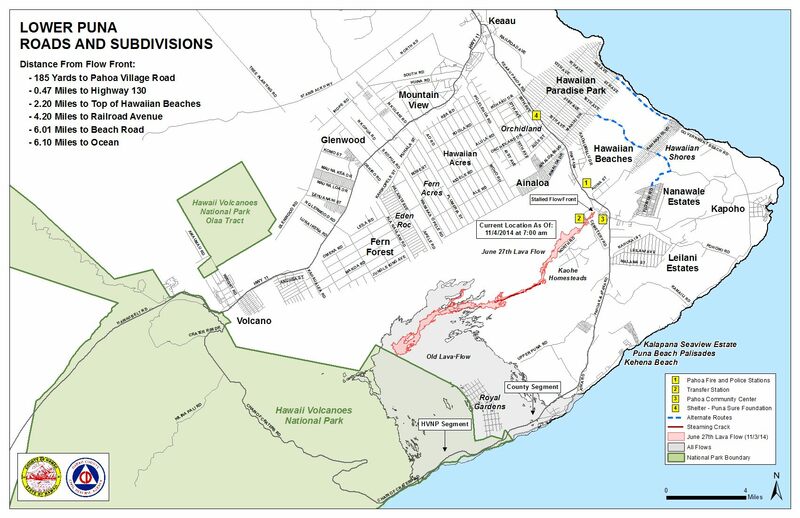 The most significant (although still minor) breakouts were occurring about 370 meters (405 yards) above Apaʻa Street on Tuesday afternoon. A brief helicopter overflight on Tuesday afternoon confirmed that little surface lava is present on the June 27th flow field. The outbreaks on the North and South margins of the flow near Kaohe Homesteads have also subsided relative to a few days ago. 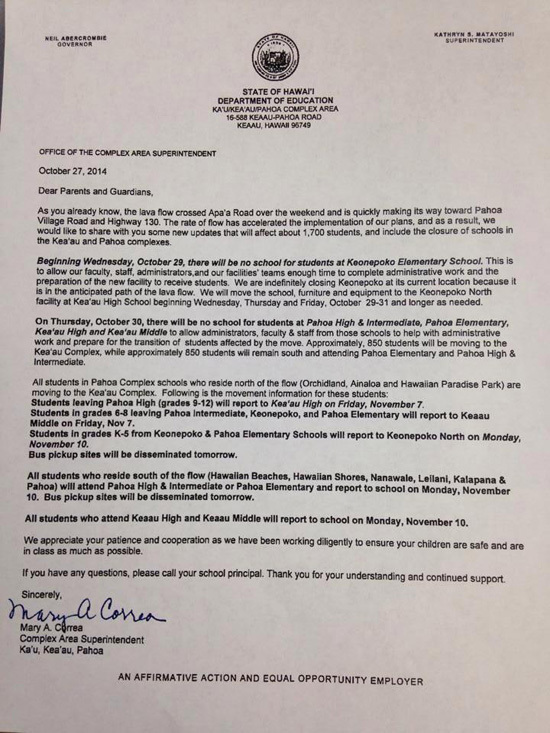 There was no net summit deformation throughout Tuesday. 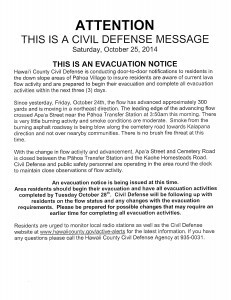 A helicopter overflight of the entire flow field is scheduled for Wednesday afternoon. A daily update will be posted in the morning, and status reports will be issued as new information becomes available. 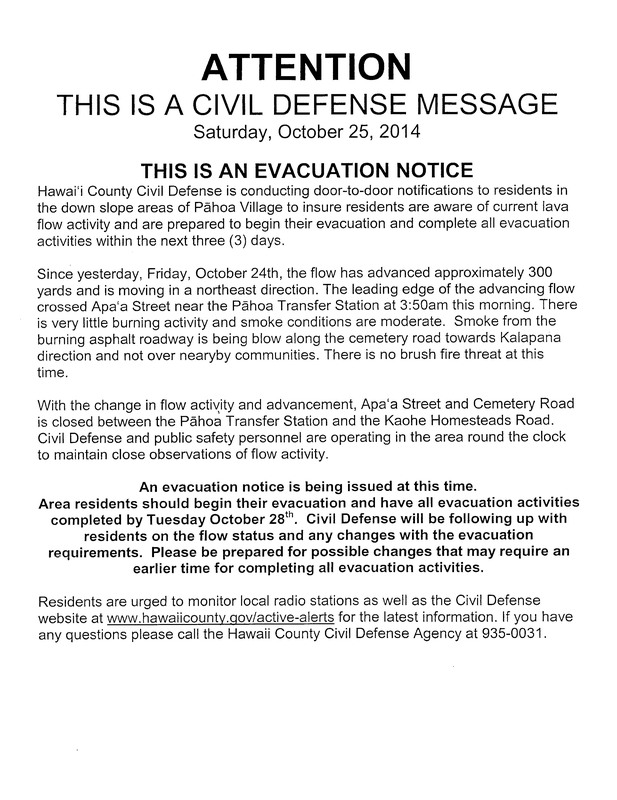 Updates are posted at hvo.wr.usgs.gov/activity/kilau….